When replacing a hydraulic hammer tool make sure to wear protective glasses and helmet when either removing or fitting the tool. Metal chips may fly off when the retaining bar is hammered out. Never use your fingers to check the alignment of the recession in the tool. For additional tips and safety advice, please refer to your Owner Safety Manual. Or, if you have questions, call RJ Hydraulic Hammers and Heavy Parts at 1-888-651-0187. 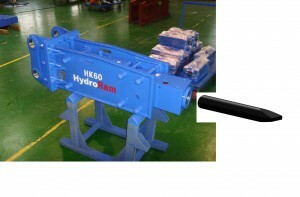 ← What is the Best Oil to Use in A Hydraulic Hammer?